The Boston Bruins got near-perfect special teams play in desert, scoring three power play goals (including two by Patrice Bergeron) on six tries, plus a short-handed marker by Brad Marchand to defeat the Arizona Coyotes by a 5-3 score, raising the record to 2-3 after five games. Tuukka Rask made 23 saves to post his first ‘W’ of the season for Boston. A sleepy first 40 minutes saw a barrage of goals in the final period (B’s got four, Coyotes two), as the B’s took their second victory of the season after going 0-3 at home. Arizona got goals 2:24 apart by Tobias Rieder and Kyle Chipchura to even the game at 3 goals apiece with plenty of time on the clock. However, Bergeron broke the deadlock with a power play goal about mid-way through the third, redirecting a Ryan Spooner shot/pass into the net behind Coyotes goaltender Mike Smith for the tally that stood up as the winner. As was the case in Denver Wednesday night, the B’s came out with energy and enjoyed an advantage in territorial play early. However, unlike the Avalanche, they were unable to solve Smith. Arizona opened the scoring on a goal by veteran Shane Doan, whose initial shot was stopped by Rask, but defenseman Kevan Miller’s skate made contact with the puck and it slid into the net for Doan’s 900th career point. Coach Claude Julien issued a second unsuccessful coach’s challenge in as many tries, making the case that Arizona forward Joe Vitale had entered the crease and made contact with the Boston netminder. Unfortunately for Julien, even though Vitale entered the crease on his own and did bump Rask, the referee elected not to overrule himself and the call stood, maintaining that the contact was not related to the play that resulted in the puck crossing the goal line. The B’s tied the game in the second period when fourth-line winger Tyler Randell scored his second goal in as many games, rifling a nifty backhander over Smith and into the net. The B’s extended their lead while on the power play later in the period when David Krejci took a Torey Krug (2 assists, 22:55 TOI, 5 shots, 5 blocked shots) cross-ice pass and buried it with a rocket one-timer for his team-leading fourth goal of the season. In the third period, the B’s made it 3-1 when Marchand got behind the Arizona defense, took a Tommy Cross bank clear/pass off the glass, and went in alone on Smith, beating him with a quick backhander. That gave Marchand his first goal of the season and Cross his first career NHL point. He was victimized on the Doan goal after an errant pass gave Arizona possession, but he ended up handling the rest of the game in solid fashion. As long as the Bruins keep winning, Julien and company will likely keep rolling Cross out there. Although the Coyotes struck back and gave Boston fans an element of “here we go again” nerves, Bergeron’s first goal of the night restored the lead and then he struck again after Adam McQuaid drew an interference call late, firing a wrist shot that Smith whiffed on to close out the scoring. With Boston’s power play at the top of the league and Krejci leading the way in scoring while admittedly very early on, this Bruins team has strung together a pair of hard-working victories, scoring 11 goals after netting just seven in their first three. Patrice Bergeron- With a pair of power play goals and his usual solid play, Bergeron led by example tonight, firing 8 shots on net and being rewarded by the coaches with more than 22 minutes of ice time. Brad Marchand- The pesky little waterbug showed why he is so valuable to the club, netting his first goal of the year while the B’s were killing a penalty and generating multiple other scoring chances. He creates opportunities with his speed, but he’s a smart player, too. While on the power play, he took a Zdeno Chara shot off the leg, but had the presence of mind to get his stick on the puck and work it back out to the point so the B’s could reset. That’s going to get a thumbs up from the coaches when they break down film on this one. The team is so glad to have him back after his concussion and he looked to be suffering nothing in the way of after effects tonight. Tuukka Rask- The save percentage (.870) is nothing to write home about, but the two points are huge for him. The Bruins don’t win this game without their main man in net. His tremendous save on Rieder after Anthony DuClair set him up for a glittering chance late in the second period was a highlight reel stop and reinforces the old adage of- it isn’t how many goals you give up, but when you give them up that matters more. Although Rieder would get Rask later on a rebound of his own shot after the B’s were just standing around while killing a penalty, Boston got enough offense tonight that their goaltender’s saves pulled them through. 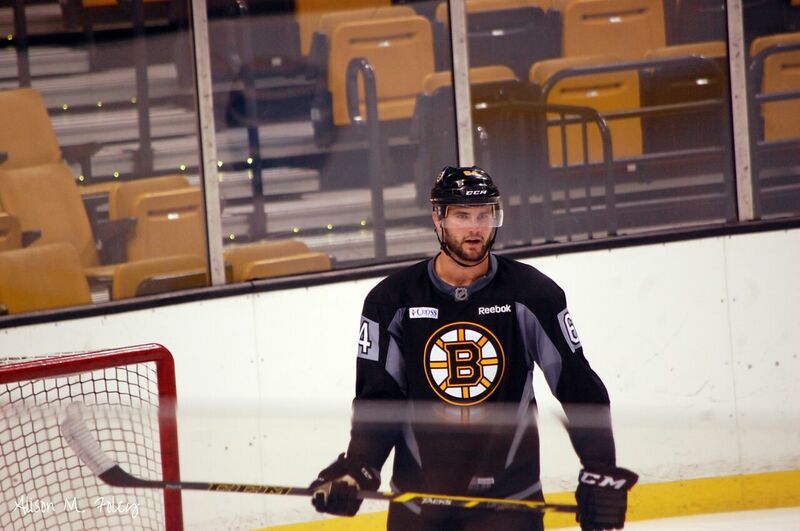 David Krejci- One of the great things about David is how serious he is. People who haven’t been around him don’t appreciate his off-the-charts competitive drive and how tough he is on himself when he doesn’t perform. He was immensely disappointed not only in the fact that the Bruins missed the playoffs last year, but that he had a pretty poor season by his standards even though he was less than 100 percent most of the time. He heard and read the criticisms of his contract extension, so he’s doing the only thing he knows how- playing his best to silence the doubters by producing like a $7M a year player. His scoring clip is probably not sustainable for him given his overall body of work, but if there was one player on this team who needed a quick start, it was him. It’s just Krejci being Krejci really, but he’s playing with a ton of confidence, so don’t be surprised if he sets career bests in all categories this year. Tyler Randell- He once scored four goals in a single playoff game while in the OHL, so Randell has always had the hands…he showed them off again tonight lasering a backhand shot past Smith before the Coyotes goalie could react. And we haven’t even had a chance to see Randell do what he’s on the team for yet…his toughness. Boston may have found a fixture for the bottom line. It’s early yet, but if you think Boston fans like him now, wait until he drops the gloves a few times. Special Teams- 3/6 with the man advantage, 1 shorthanded goal. The Rieder goal that came on the same power play just 13 seconds later was the only blemish on the night. 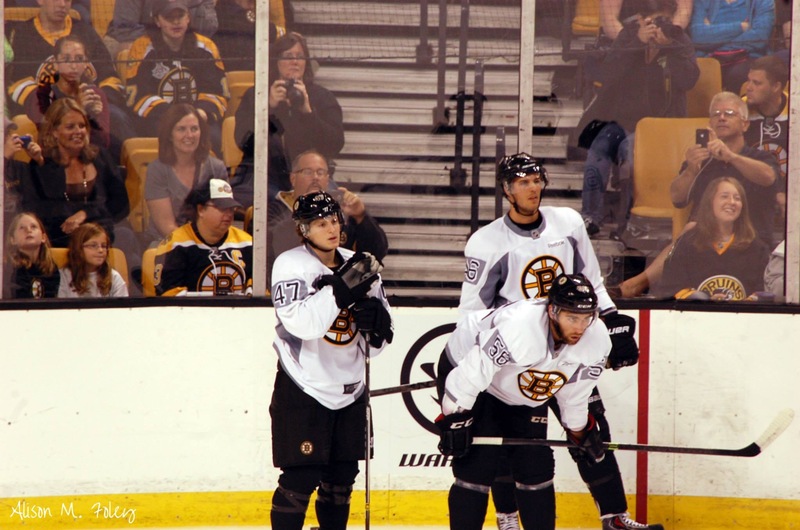 Spooner and Krug are particularly impressive on the power play with the way they move the puck around. The hands, the vision, the ability to take advantage of the added time and space- this is precisely what every good team with the extra man tries to do. It’s nice to see a couple of young players- former housemates in Providence- demonstrating the kind of chemistry and skill they’ve shown together. It was a well-played game across the board for Boston. They still have problems with coverage in front of their net, especially when teams overload and the B’s have trouble sorting out who is responsible for what. However, on this night- not singling anyone out. Sure- there were some mistakes, and some guys looked slower and hobbled at times, but the team pulled together for another gritty win and with the special teams looking as strong as they have early on, you can see that even if the 2015-16 Bruins might lack the talent to keep up consistently with the NHL’s powers, there is some character in this plucky bunch. They head back to Boston on a high note with some time to refresh before taking on Philadelphia at home on Wednesday. Time to give the hometown fans something to cheer about, boys. The Boston Bruins posted their first win of the season in Denver by a 6-2 score by jumping on the Colorado Avalanche and racing to a 5-0 lead. They chased starter Semyon Varlamov from the net and by dominating the puck possession game by limiting the Avs to just 12 shots in the first 40 minutes. The 3rd line made the biggest difference keyed by Jimmy Hayes (1g, 4 points) and Ryan Spooner (1g, 2 points), forechecking effectively, forcing turnovers and then capitalizing on said turnovers with goals by Chris Kelly and Spooner in the second frame. The game marked a couple of first career appearances for defenseman Tommy Cross and winger Tyler Randell. Cross became the second player from Boston’s 2007 draft class (Zach Hamill) and Randell the third from 2009 (Jordan Caron, Lane McDermid) to skate in the big show. Jonas Gustavsson got his first NHL start for the Bruins, and wasn’t tested all that much. He held Colorado off the scoreboard until late in the second frame when David Pastrnak took a double-minor for high sticking former teammate Carl Soderbergh. Fellow Swede Gabriel Landeskog spun around with the puck just outside the crease, and Zdeno Chara (2 assists) tried to poke it off his stick, but inadvertently pushed it past Gustavsson to make it 5-1 after two periods. Fourth-line center John Mitchell made it 5-2 on a lazy outside shot that caught Gustavsson cheating. This is a shame because the Monster made some excellent stops while his team was on the power play earlier in the period, so to give up such a soft goal with a little under 9 minutes left took some of the shine off of an otherwise solid performance in net (he made a terrific breakaway stop on Avs top draft pick Mikko Rantanen in the first period to keep Colorado off the board). Boston’s top two lines had a quiet night with no goals scored (save for David Krejci’s empty net tally at the end), but that’s how its supposed to work- the big horses had generated much of the team’s offense in the three losses- so to have the bottom two lines, plus Kevan Miller grab hold of the scoring load is a good sign. The team’s strength is up front, so for one night at least, things are back on track. Jimmy Hayes- He was in the “down” section for the Tampa Bay game, but he bounced back with a career-best 4-point night in this one, tallying the second goal of the contest by batting a Chara rebound out of the air and into the net. You could tell by his celly that a huge weight was taken off his shoulders with that one. The added pressure that local boys feel when they put on that spoked B is real, but Hayes wasn’t done. He forced a neutral zone turnover i the second period, getting the puck to Spooner, who fed Kelly with a backhand sauce pass. The veteran then skated in, made a quick deke in traffic and put the puck past Varlamov to make it 4-0. Hayes then forced another turnover deep in the Colorado zone and got it to Spooner on a backhander, who roofed a shot for his first goal of the season to finish Varlamov’s night. Hayes added an assist on Krejci’s empty-netter to seal the win. He skated a more uptempo game, and just maybe- getting away from Boston and the TD Garden was good for him. On this night, Hayes looked like he was having a lot of fun out there, and let’s face it- even though these guys are professionals, that’s how it should be for the most part. Ryan Spooner- Along with Pastrnak, Spooner is Boston’s most dynamic forward, so if he isn’t scoring, he’s probably not helping a whole lot. Having said that- tonight he was skating hard on the forecheck, creating problems for Colorado as they tried to gain possession in their own end and break the puck out. He’s never going to be a stalwart two-way center, but the Bruins don’t need him to be that. He has to give a good effort away from the puck, but as long as he’s making things happen on offense, the team can live with the occasional lapses that will happen. His assist on the Kelly goal looked effortless- it wasn’t- and his first goal of the season was a pure snipe to the top shelf that was off his stick in a blur. Tyler Randell- He became the first Bruin to score in his debut since Blake Wheeler back in October, 2008- which was interestingly enough- some eight months before Boston drafted Randell in Montreal. That’s how long it has been, and if you had said smart money would be on Randell finding the back of the net in his NHL debut, you should go out and get your lottery ticket. The rugged, physical forward didn’t have to do much in that regard, but his goal was vintage Randell: he tipped Adam McQuaid’s point blast home, demonstrating his slick hands. The skating is what has kept him from the NHL prior to now, but you can see that he has value on the bottom line, especially when things get tough. He won’t thrive in an uptempo game, but he’s proving that in the right role, there’s a place for him on this club. 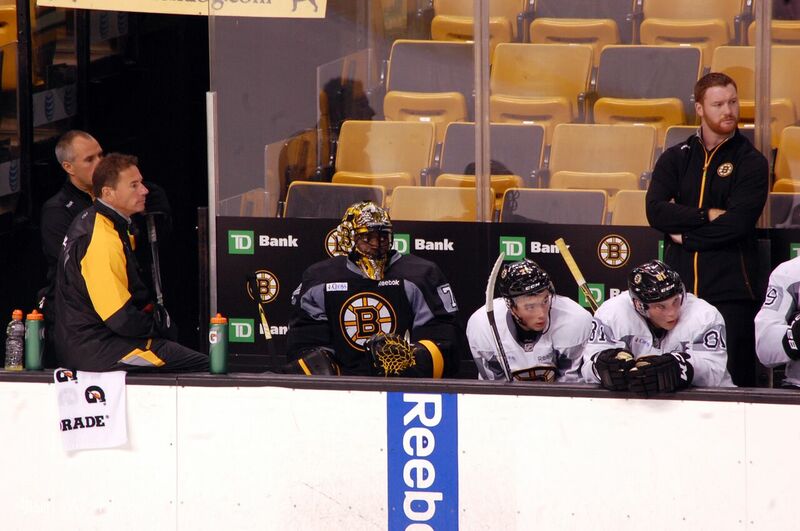 Chris Kelly- The veteran looks pretty good on the third line left wing with Spooner and Hayes. He’s not the fastest guy out there, but he’s smart, industrious and in scoring his first of the season, showed off the slick hands that he previously parlayed into 20+ goals. Anytime you can get offense out of Kelly it’s a bonus, because he’s such a key leader and sterling example for the younger players. He may not be the most skilled LW to put on that line, but he’s getting the job done. Tommy Cross- It was a solid, unspectacular night. He played sheltered minutes and wasn’t asked to do a whole lot, but for a guy who was drafted nearly nine years ago, he deserves ups for getting here. Cross is an NHL player- no one can take that from him. What happens from here partly up to him and partly not, but for one night- he looked like he belonged, and there are a lot more folks out there than this columnist who are genuinely happy for a genuinely good guy. Kevan Miller- He opened the scoring on an absolute bomb from the point that rang off the far post and clanked in. For a guy who missed the second half of last season to have shoulder surgery, he looked like a winner on that play. Adam McQuaid- Forget about the assist on Randell’s goal- did you see that nifty little spin move he put on along the half-wall to shake the defender and maintain possession, then fed it out in front to Loui Eriksson, who was stoned on what would have been a highlight goal? Wow- where did that come from?! He then put the puck to the net on the ensuing play and Randell tipped it in…great shift for No. 54. Brett Connolly- He’ll show it in flashes, but the consistent shifts where Connolly is working, creating and making an impact on the game are still lacking. The B’s need a lot more from him. If you didn’t see it at all, it would make for an easy call for the coaches, but the talent is there for the former sixth overall pick. He’s still looking for his first goal as a Bruin and he had a great chance in the first period (right before Miller scored) when sent in alone on Varlamov but couldn’t even hit the net. Joonas Kemppainen- Another soft performance from the Finnish newcomer. He’s not strong enough on pucks to these eyes and seems to be around the play a lot, which is a sign of his good hockey IQ, but he has left me wanting more. Kemppainen looks like a player, but he’s got to get more engaged to make a difference. The good news- B’s fans won’t have to wonder about any more losses to increase the winless streak, and you have to hand it to the team for cooling off a hot offense at home. However, there is still plenty of work ahead for this group- improvements are showing through in their play, especially in puck support along the walls, so there isn’t a whole lot to take issue with on this one. Brett Connolly scored a pair of goals including one just 40 seconds into Wednesday’s contest, but the Boston Bruins dropped their second exhibition game in as many tries after starting the preseason 4-0. As pointed out to me on Twitter by several B’s fans, the Rangers were icing a lineup much closer to their NHL roster than Boston was, so there is room for praise for the job the Boston squad did in keeping the lead until the last 3 minutes or so of the second period and then coming back to within one goal late in the final frame. In the end, however, it wasn’t enough. The B’s lost in regulation, but the teams played a 5-minute 3-on-3 overtime session that failed to generate a score, despite the Rangers getting a power play after Alex Khokhlachev was assessed an obstruction foul. Fans will need to get used to these kinds of games going forward this season- yes, the team was without many of its top players last night, but even with a full roster, the Bruins will be challenged to score goals on the regular basis. They will have to cash in on the opportunities they do create (and those given them by opponents) and outwork other clubs in order to make the playoffs. Brett Connolly- He accounted for all of the offense last night, and it was the best of the three preseason games we’ve seen from him. His second goal was batted baseball style out of midair and into the net, displaying some excellent hand-eye coordination. On the downside, he’s still turning the puck over and making some mistakes to nitpick, but you could see last night why he was a top draft pick five years ago. Connolly is more than capable of scoring 25 goals this year for Boston, but Claude Julien will stress attention to detail with him to mitigate some of the mistakes he makes with and without the puck. Zach Trotman- Last pick in 2010 played a strong defensive game and assisted on Connolly’s second tally by denying a Rangers clearing attempt at the blue line and throwing the puck to the net. He may not be the most instinctive of defenders, but Trotman’s 6-4 height and 220-pound frame, along with his mobility allow him to make plays at both ends of the ice. Sometimes, you wonder about people’s expectations- it isn’t like Trotman was a first- or second-round selection and recognized talent to play a prominent role. He was a developmental project player from the get-go and has worked hard to put himself into the NHL picture in Boston- some of these same critics fall all over themselves to praise Koko who has yet to turn any of his flashy plays into production, yet Trotman came through with a statement game last night. It’s the internet and all, but my guess is that on opening night- No. 62 will be in the Boston lineup and No. 76 won’t. Colin Miller- I think we’ve seen enough- the former Kings prospect is an NHL player, and the Bruins will benefit from his skating, puckhandling and big-time point shot. On one particular sequence in the second period, the puck was thrown to the net as he was cutting to the short side. It hit his skate, but even at speed, Miller was able to corral it with his stick and get a shot off. Henrik Lundqvist made a terrific save, but it was the kind of effortless-looking play that is much harder for most to pull off. Miller belongs on this team, end of story. Joonas Kemppainen- The Finnish free agent has the look of a solid fourth-line center with his faceoff work and disciplined play in all 200 feet of the rink. He’s not a dynamic skater, but as a big guy, he doesn’t have to be. He uses his stick effectively to disrupt plays on the penalty kill and has been in the right position throughout the preseason. He’s not a player who will bring a lot of offensive production to the table, but his heavy game is well suited for the bottom line and with the right wingers, so long as that unit can chip in and play some quality minutes, the B’s are on the right track. Jimmy Hayes- He was active and involved in the play all night. He’s not as skilled as younger brother Kevin, but he brings more tenacity and “want to” in my opinion. The team had him wearing the ‘A’ last night, and Hayes continued his solid if unspectacular play in the preseason, tallying a helper on Connolly’s first goal. He’s clearly enjoying being a Bruin, and he’s a valued addition on a team that is going to need every ounce of his talent and 6-6 frame to get some gritty, dirty goals on any given night. Ryan Spooner- Boston’s third-line center showed off his ability to work the wall last night, at one point during a power play in the second period generating quality scoring chances from both sides of the ice. Koko just missed sending him in alone on a breakaway during the 3-on-3 overtime session, and he might have ended it right there. Spooner is at his best when pushing the pace of the offense and backing defenses up with his speed. Unfortunately, he also made a poor decision late in the second period to make a cross-ice pass after gaining the offensive zone that was deflected away and resulted in a rush the other way that saw J.T. Miller put the Rangers up 2-1 with about 37 seconds remaining on the clock. Those are the kinds of plays that will get any player a stern talking to from the coaches- it was risky and ended up being costly. He did have an assist on Boston’s second goal of the night, however. Alex Khokhlachev- At some point the energy, hustle and skill plays need to amount to points on the board and it’s just not there. It seems to me that there is an element of fans who want him on the team no matter what, and I can understand that- everyone has an opinion, and he’s undoubtedly more talented than a couple of the veterans who are likely to beat him out for a spot coming out of camp. But one wonders if Max Talbot was showing the same kind of energy, would people go out of their way to praise him as seems to be the case for Koko? For a guy who made it clear that he sees himself as an NHL player, he sure hasn’t been able to find away to produce, and that’s going to be the difference when he is optioned to Providence to start the year. The B’s can and will almost certainly bring him back up at some point (unless Don Sweeney trades him elsewhere- but the kind of value Koko will get at this stage is anyone’s guess), but enough of the grasping at straws- potential is just that- potential…until it is realized through tangible results. It would be one thing if he was scoring a point or three each night he went out there, but he’s not doing that. In the end, it doesn’t matter what any of us on the outside think- Boston management and coaches have the power to decide, and in Koko’s case- it’s pretty simple: where’s the beef? There is no denying the skill, but the team rightfully expects more from him. Adam McQuaid- The most memorable play of the night from him came on Miller’s late second period goal when he backed up too much in the Boston zone, giving the Ranger forward the time and space to rip a wicked shot into the net, taking the lead. You love McQuaid’s character and toughness, but his mobility and decision-making at times will result in plays like this one. During the course of the season he’s going to make some plays and give some up- if not for the AAV on his contract extension, few would have any issue with his presence. It’s the nature of the beast in this modern cap world. Jonas Gustavsson- Playing in just his second contest since coming to camp on a PTO, it was a good news/bad news kind of game for the veteran. He was victimized on the first goal, which came on a screen and deflected in off of Trotman’s skate. But he was beaten cleanly on a shot by Miller to break a 1-1 tie, and in the third period, was unable to get across the crease when Rick Nash’s attempted pass was blocked by Matt Irwin. Nash, doing what top goal scorers like him do, grabbed the puck as it bounced back to him and popped it into the yawning open side as Gustavsson was caught by the shortside post. Neither Gustavsson nor Smith have been outstanding in exhibition play, but they have been serviceable. Gustavsson held the fort later in the game and in the OT when the Rangers were on a 4-on-3 man advantage, so flip a coin between the two for Boston’s backup spot. It’s close, and with Smith under contract, he just might get the nod. Zac Rinaldo- Continues to play his high motor game and drive opponents crazy with his hitting and stickwork. He took a goalie interference penalty and then was reminded of that with a hard, borderline vicious hit from Dylan McIlrath that he bounced back from. With his speed, he creates scoring chances, ringing a shot off the post at one point in the final period, but the production has not and never will be there. Rinaldo is there to bring energy, agitate, draw penalties and get opponents off their game without hurting his own team in the process. There is a segment of Boston fandom that will simply not reconcile that role with his past transgressions nor the price Boston paid to acquire him, but that’s fine- as is the case with McQuaid- he’s here like it or not. Tyler Randell- Drove to the net and worked the corners effectively. When McIrath tried to go after Rinaldo during a scrum in front of the Rangers net, Randell intercepted the New York defender and the two dropped the gloves. Both players got some shots in, and it looked like a draw, but given what Randell gave way to in terms of height and reach, the bout further enhanced his reputation as a nasty forward who can fight it out with the heavyweights. Tommy Cross- I have to give the former BC captain and 2x NCAA champion credit. He played hard and smart last night. He’s a longshot given the players the B’s have on the roster, but his character has never, ever been a question mark. Last night, he played with effort, pace and got some good shots on net from the point. He’s an NHL-capable defender in a reduced role, but the question for him is opportunity- can he get it in Boston? Brian Ferlin- Good player, but what on earth was he thinking in OT when he went to the bench for a chance with the Rangers in possession of the puck at center ice? That resulted in a 3-on-1 but somehow, the B’s survived it and transitioned back the other way, with Koko just missing sending Spooner in on a breakaway. But, Brian- yikes!